Practical Guide to Logistic Regression covers the key points of the basic logistic regression model and illustrates how to use it properly to model a binary response variable. This powerful methodology can be used to analyze data from various fields, including medical and health outcomes research, business analytics and data science, ecology, fisheries, astronomy, transportation, insurance, economics, recreation, and sports. By harnessing the capabilities of the logistic model, analysts can better understand their data, make appropriate predictions and classifications, and determine the odds of one value of a predictor compared to another. Drawing on his many years of teaching logistic regression, using logistic-based models in research, and writing about the subject, Professor Hilbe focuses on the most important features of the logistic model. Serving as a guide between the author and readers, the book explains how to construct a logistic model, interpret coefficients and odds ratios, predict probabilities and their standard errors based on the model, and evaluate the model as to its fit. Using a variety of real data examples, mostly from health outcomes, the author offers a basic step-by-step guide to developing and interpreting observation and grouped logistic models as well as penalized and exact logistic regression. He also gives a step-by-step guide to modeling Bayesian logistic regression. R statistical software is used throughout the book to display the statistical models while SAS and Stata codes for all examples are included at the end of each chapter. The example code can be adapted to readers’ own analyses. All the code is available on the author’s website. "The book presents many worked examples, and the choice of interesting data sets all of which are available to the reader is one of its greatest assets. Data availability makes it easy for readers to reproduce the examples from the book, and example code is available for R, SAS and Stata: R code is incorporated into the book chapters, and the end of each chapter gives SAS and Stata code." "… this book is written in an exceptionally clear style … An additional selling point of this text is that it introduces new R functions, which can be applied in one’s own work, as well as equivalent SAS and Stata code. … the emphasis on understanding logistic regression modelling rather than on the mechanistic application of techniques is one of the great strengths of the book. Anyone who reads this book will therefore feel that they have a good understanding of this subject …"
"Big Data is ascendant, but even the biggest data often boil down to a decision between two categories: survive or die, purchase or don’t purchase, click or don’t click, fraudulent or honest, default or pay. 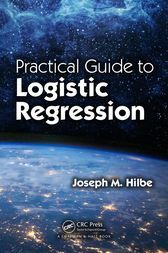 Logistic regression is the classic workhorse for this 0/1 data, and Joseph Hilbe’s new book presents a guide for the practitioner, chock full of useful R, Stata, and SAS code. Hilbe has worked with practitioners and aspiring practitioners in virtually every field that uses statistics, including for over a decade via his courses at Statistics.com. His new book is truly, in his own words, ‘a tutorial between you and me.’"
Joseph M. Hilbe is a Solar System Ambassador with NASA’s Jet Propulsion Laboratory at the California Institute of Technology, an adjunct professor of statistics at Arizona State University, and an emeritus professor at the University of Hawaii. He also teaches five web-based courses on statistical modeling at Statistics.com. He is president of the International Astrostatistics Association, elected fellow of the American Statistical Association, elected member of the International Statistical Institute, and full member of the American Astronomical Society. Professor Hilbe is one of the world’s leading statisticians in modeling discrete and longitudinal data. He has authored 16 books related to statistical modeling, including the best-selling Logistic Regression Models and Modeling Count Data. During the late 1980s and 1990s, Professor Hilbe was a leading figure in the then new area of health outcomes research, serving as director of research at a national chain of hospitals and later CEO of a national health economics firm. He was also on the executive committee forming the Health Policy Statistics Section of the American Statistical Association.